And here now the story of Mathias Ezrarian Anderson. You may know him as Hollydrift. Mother was a large influence on Mathias. She brought into the home many divergent types of music and art. She took him to art galleries when he was very small and to the symphony when he became older. He dabbled in several different forms of art trying his hand at every discipline. Alas, nothing really stuck. Both his parents encouraged his artistic endeavors but silent art was not yet in his future. What intrigued Mathias was audio. He started sound experiments at a young age with the drums. However, he found rhythm retrograde to creativity. Too restrictive. This was around the time that ‘Cars’ by Gary Numan was on the radio. When Mathias heard that song, he realized that music was finally recovering from many years of neglect. Such absolute beauty in tone and structure. That song changed his musical life. He sold his drums and bought an Arp synthesizer (very uncool in those times). Soon Mathias found other synth bands to listen to: OMD, Kraftwerk, Human League. The sound of these groups was a refreshing escape from the guitar bands that bored him senseless in the late 70’s. Mathias Anderson embraced them with all his heart. He bought more equipment. For years he tinkered with his synthesizers. Experimenting with a Wollensak tape recorder, messing with effects and the like. Mathias played in a few unmemorable bands and generally went nowhere. At this point, it’s important to mention that Mathias has been suffering clinical depression all his life. In the late eighties his therapist, stymied for an effective treatment, suggested he start writing his own compositions. Armed with new purpose, Mathias bought enough equipment for a four track home studio and began writing. Eventually, he found his synthesizers too restricting as well. He started carrying a tape recorder around with him and building his compositions with found sounds. From 1988-1992, Mathias wrote and released his work under the name Joy Before The Storm and became deeply involved in the cassette culture. His music was a sparse blend of captured sounds, spoken/sung voices, synths, and an occasional rhythm. He received favorable response from his music (although people could not pigeon hole it) but Mathias found that a listenership was superfluous to the therapeutic index of creation. The studio became his therapy. In 1992, Mathias got the urge to try different forms of art. He sold his studio, took a break from music and engaged himself in photography and installation art. Thus producing a seven-year silence. 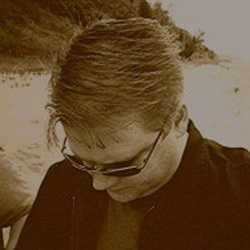 In the winter of 1999, Mathias returned to audio composing under the name Hollydrift. Now instead of a cassette, he carries around a portable minidisc recorder. His studio (Lauder Sandburg) is now a digital 8 track. The music has changed a bit, too. It's now darker and more dense. Still full of found sounds but with more manipulation and more noise. 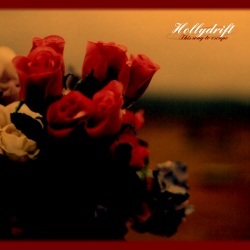 Hollydrift does not play live. Mathias doesn’t see how he could possibly do justice to any of his work in a live setting. There is shyness, too, that causes problems. However, Mathias Ezrarian Anderson is perfectly content to hole up in his studio creating audio travels. Whether you listen to them or not.